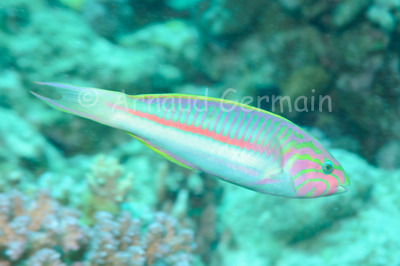 Another very colourful wrasse which lives on the sandy bottoms of the Red Sea. You can find this fish in very shallow water as well as in deeper water. It is a common fish around the Red Sea. Nikon D700, Nikon 28-105 mm macro at 105mm, F8, 1/125th, ISO 400, Ikelite Housing and Ikelite DS160 strobe set on TTL.